An astounding $US4 trillion worth of merchandise will be abandoned in online shopping carts this year, and about 63% of that is potentially recoverable by savvy online retailers, according to estimates from BI Intelligence, Business Insider’s tech industry research service. 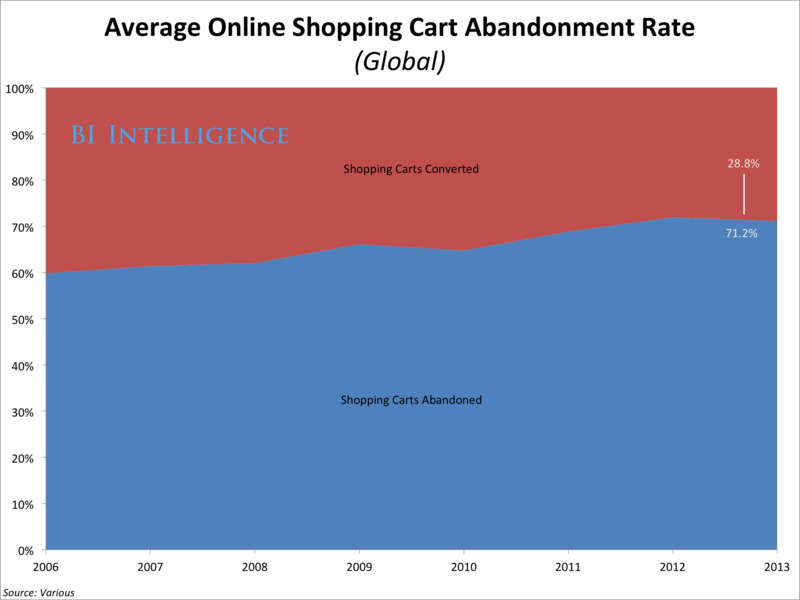 Shopping cart abandonment is growing. The data shows that around three-fourths of all shopping carts will be abandoned by online shoppers this year. In a recent report, BI Intelligence explains what leads a shopper to abandon an online purchase and how retailers can begin to combat rising shopping cart abandonment rates. We collected and analysed data from top e-commerce companies, and spoke with industry experts whose job it is to reduce abandonment rates and boost conversions, to come up with a number of solutions that can help retailers recover lost sales. Approximately $US4 trillion worth of merchandise will be abandoned in online shopping carts this year, and about 63% of that is potentially recoverable by savvy online retailers , according to BI Intelligence estimates. An abandoned shopping cart does not automatically translate to a “lost sale,” because three-fourths of shoppers who have abandoned shopping carts say they plan to return to the retailer’s website or store to make a purchase , according to data from SeeWhy. Online-only retailers are at a disadvantage to “omnichannel” retailers in this respect because they have fewer channels through which to recover lost sales. For full access to all BI Intelligence’s charts and analysis on the e-commerce industry — including downloadable Excel files — sign up for a risk-free trial.